The ALL NEW Americana SKP model is very complete and functional, if ordered with no or minimal options. Included in the factory order base price is: Mountain rated hydraulic disc brakes, an upgraded Americana Dream Sofa bed, the most comfortable wall hugger recliner chairs (because our stuffed chairs are designed for homes and not RVs). Also included in the base price is: a battery, King sized bed, microwave oven, double door 8 cu ft refrigerator, “Corian” solid surface kitchen counter tops, booth dinette, electric front jack,outside scrutiny lights, stereo and upgraded carpet. It’s the fabulous selection of optional features and equipment that really separates an Americana model from the “run-of-themill” fifthwheels, currently available from Midwestern manufacturers.Many of our options are exclusively ours. Our customers often save a large freight bill, by checking out their new SKP model in Elkhart. Therefore we have worked hard at creating all the good space. According to our customers with the SKP 39/40SB, we have excelled at the real and perceived open living space. To do so, we had to make sure that our customers have an uninterrupted view, all the way from the rear recliner chairs to the bathroom wall at the door entryway. We really need a kitchen with all the good spaces but often fifthwheel manufactures install overhead cabinets with L returns that block front to back viewing space. Our SKP 39/40SB has no such obtrusive eyestopping overhead cabinets. Instead, we created upper and lower wall cabinets almost 8 long and then added the great counter utility of a large lower cabinet U shaped layout. It just so happens that a U shaped kitchen cabinet yields excellent full depth drawer space, and lots of below-counter shelf space. 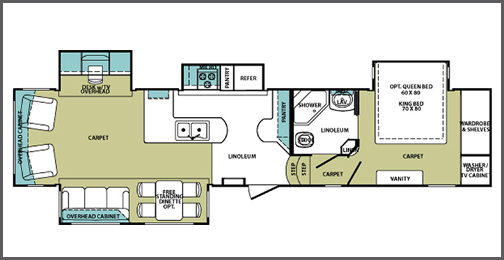 The SKP 39/40 floorplan with maximized design and customer space requirements, has become a main choice for full-timers. • Local to you, quality independent service available. • Finished & upfitted by the most experienced fifthwheel company in the country. 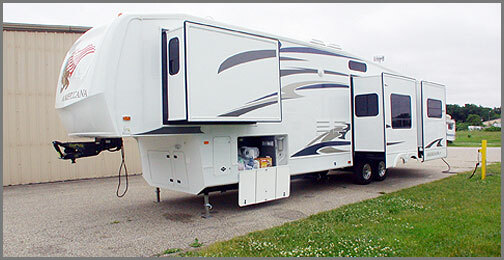 • We build tuff fifthwheels for tough customers.